Sen. Elizabeth Warren (D., Mass.) is proposing a "Ultra-Millionaire tax" on people with more than $50 million in assets. Following reports that she would propose such a "wealth tax," she sent a fundraising email Thursday night saying the wealth gap was causing opportunity to slip away. "That’s why today I’m proposing a tax on the wealth of the richest Americans," she wrote. "It will only affect the tippy-top 0.1% of the wealthy, those with a net worth of over $50 million. I’m calling it the "Ultra-Millionaire Tax," and we can use the significant revenue it creates to start rebuilding our middle class." 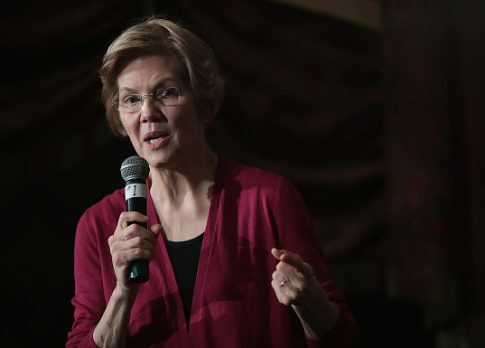 Warren, one of the top contenders for the 2020 Democratic presidential nomination, has been taking advise from liberal Berkeley economists Emmanuel Saez and Gabriel Zucman on the proposal to reduce the wealth gap, a key issue for progressives. The plan would levy a 2-percent wealth tax on Americans with assets above $50 million, and a 3-percent tax on those who have more than $1 billion, Saez said. "The Warren wealth tax is pretty big. We think it could have a significant affect on wealth concentration in the long run," Saez told the Washington Post. "This is a very interesting development with deep root causes: the fact inequality has been increasing so much, particularly in wealth, and the feeling our current tax system doesn’t do a very good job taxing the very richest people." "Our tax laws have been written by the wealthy and well-connected to benefit the wealthy and wealth-connected," Warren wrote in the email. "But not for long. We’re building a grassroots movement to return power to the people." Saez claimed the taxes would raise $2.75 trillion over 10 years, but the right-leaning Tax Foundation says a wealth tax "would reduce investment, wages, employment, incomes, and output." In 2014, Warren dodged a question from Huffington Post about whether she would embrace such a measure. "I want to put it this way: We need to take a hard look overall at our approach to taxation," Warren said. "That includes every part of it — [the tax code] has become so riddled with loopholes and exceptions that were lobbied in by powerful corporations and individuals with buckets of money. You don’t want to start with any one part of it, because that isn’t the point. The point is the whole thing has to be on the table at once." Warren, who formed a presidential exploratory committee in late December, has made helping the middle class and working Americans the crux of her message. She frequently blasts the economic system as rigged in favor of the wealthy by corrupt Washington bureaucrats. UPDATE: 8:20 P.M.: This article was updated to include Warren's new fundraising email about her tax proposal. This entry was posted in Politics and tagged 2020 Election, Elizabeth Warren, Tax Hikes. Bookmark the permalink.